Ali Akbar Hashemi Rafsanjani, once one of Iran’s most influential men, now has two children in Tehran’s Evin prison -- where opposition activists and critics of the Islamic establishment are routinely held. 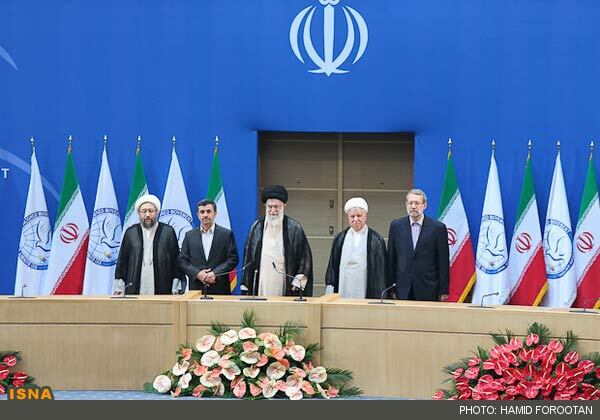 Former President Ali Akbar Hashemi Rafsanjani (second from right) stands next to Supreme Leader Ayatollah Ali Khamenei (center) at the opening session of the Nonaligned Movement summit in Tehran in August. The arrests are just the latest blow to the former president, who has long come under fire from hard-liners over his support for the opposition movement that challenged the reelection in 2009 of President Mahmud Ahmadinejad. In the past four years the pragmatic Rafsanjani -- whose star began to fade after his defeat at the hands of Ahmadinejad in the 2005 presidential election -- has been banned from leading Tehran’s Friday Prayers, lost his role as the head of the Assembly of Experts, and been openly attacked at public events. The jailing of his son and daughter (he has five children in all) marks an escalation of pressure and comes as he appeared poised to regain some prominence. Rafsanjani’s daughter, former Iranian lawmaker Faezeh Hashemi, was detained late on September 22 and made to begin serving a six-month jail sentence she was given in January when she was convicted of antistate propaganda and insulting Iran’s leaders following the crackdown on election protesters. Hashemi had spoken out against Ahmadinejad’s reelection and criticized the postelection repression. Her arrest over the weekend was seen as a warning to Rafsanjani and his son, Mehdi Hashemi, who was already planning to return to Iran after a three-year stay abroad. Rafsanjani’s other daughter, Fatemeh Rafsanjani, told the opposition Kalameh website that the head of the judiciary and other officials told Hashemi Rafsanjani that his son should return to Iran. Nevertheless, one day after his sister was jailed, Mehdi Hashemi -- who had been also charged with antistate propaganda and corruption -- returned to Iran. On September 24, as expected, he ended up in jail after being summoned and questioned by prosecutors. Washington-based political analyst Ali Afshari believes the events signal that radicals within the Iranian establishment are determined to clip Rafsanjani’s wings even further. “Ahead of the 2013 presidential vote, hard-liners are trying to neutralize Rafsanjani’s moves and prevent the political atmosphere from opening up," Afshari says. During a recent Nonaligned Movement (NAM) summit hosted by Iran, Rafsanjani made a high-profile appearance next to Khamenei, leading to speculation that he was being rehabilitated at a time when Iran faces unprecedented international pressure. Days after the summit, the former president called publicly for “free and transparent” elections as a solution to much of the country’s problems and warned that Iran was facing a critical situation. Those comments were too much for Iran’s powerful hard-liners to take, says New York-based Iranian journalist Roozbeh Mirebrahimi. Rafsanjani has not publicly commented on the arrest of his son and daughter. A video released on Iranian news websites -- which can be seen here -- shows him saying farewell to his son Mehdi on September 24, shortly before the younger Rafsanjani turned himself in to authorities. Rafsanjani is seen hugging him and reciting a prayer for travelers. Rafsanjani, considered a pillar of Iran's Islamic Revolution, is nicknamed “the Shark” because of his lack of a beard but also because of his perceived political shrewdness. Many people will be watching closely to see what he does next.